There are 40 Assisted Living Facilities in the Tacoma area, with 21 in Tacoma and 19 nearby. The average cost of assisted living in Tacoma is $3,049 per month. This is lower than the national median of $3,346. Cheaper nearby regions include Milton with an average starting cost of $2,675. To help you with your search, browse the 168 reviews below for assisted living facilities in Tacoma. On average, consumers rate assisted living in Tacoma 4.4 out of 5 stars. Better rated regions include University Place with an average rating of 4.5 out of 5 stars. Caring.com has helped thousands of families find high-quality senior care. To speak with one of our Family Advisors about assisted living options and costs in Tacoma, call (855) 863-8283. Tacoma is a port city on the Puget Sound in western Washington. This birthplace of Bing Crosby is known as the “City of Destiny” as it became the westernmost terminus of the North Pacific Railroad in the late 1800s. In Tacoma, seniors account for approximately 12.8 percent of the population and are accommodated by 58 assisted living facilities (ALFs) in and around the city. These communities provide homes for independent seniors while offering help with daily activities and medication management and are regulated by the Washington State Department of Social and Health Services. The cost of living in Tacoma is 12.9 percent higher than the U.S. average. This is primarily due to above average real estate costs, with health care, grocery and transportation costs only slightly above national medians. Winters in Tacoma can be very cold and wet, with average temperatures in January falling to around 35 degrees Fahrenheit. The city gets approximately 41 inches of rain per year, slightly above the U.S. average of 39. Summers are warm, dry and pleasant with average temperatures around 75 degrees Fahrenheit. Washington has no state income tax, so income from Social Security in Tacoma is tax-free, which leaves more money for seniors looking for assisted living in the city. In Tacoma, seniors who do not drive can get around the city on the Pierce Transit bus system where they can ride all day on one reduced fare ticket. The Lighthouse Senior Center and the Beacon Senior Center provide vans for registered seniors who need transportation. Tacoma has a thriving arts community with public and performance art including six major museums. It is also home to three different wineries. Metro Parks Tacoma’s STAR Center offers day trips to local destinations along with senior dances, group fitness and workshops. The Tacoma area is home to world-class medical facilities, including MultiCare Tacoma General, St. Joseph Medical Center and MultiCare Allenmore Hospital, in the event of medical emergencies or illness. Assisted Living costs in Tacoma start around $3,049 per month on average, while the nationwide average cost of assisted living is $4,000 per month, according to the latest figures from Genworth’s Cost of Care Survey. It’s important to note that assisted living rates in Tacoma and the surrounding suburbs can vary widely based on factors such as location, the level of care needed, apartment size and the types of amenities offered at each community. 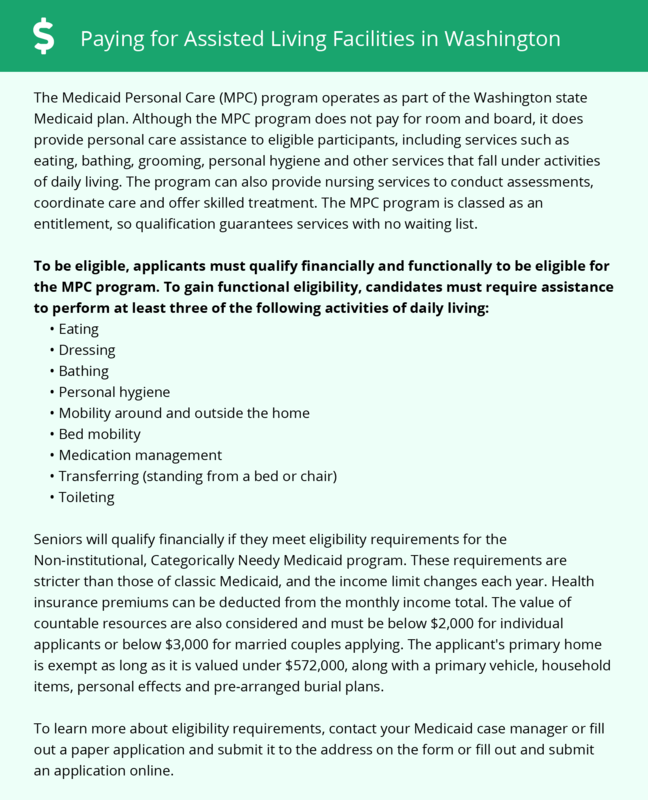 Seniors residing in Washington can apply for financial assistance for assisted living through a few Medicaid programs. The Medicaid Personal Care (MPC) program and the Community First Choice Option (CFCO) provide financial support for personal care assistance and costs other than room and board. Washington also offers seniors Home and Community Based Services (HCBS) Medicaid Waivers including the Washington Medical COPES (Community Options Program Entry System) Waiver for additional funding for assisted living. To see a list of free assisted living resources in Tacoma, please visit our Assisted Living in Washington page. Tacoma-area assisted living communities must adhere to the comprehensive set of state laws and regulations that all assisted living communities in Washington are required to follow. Visit our Assisted Living in Washington page for more information about these laws.